I remember the first time I read a book by Lawrence Block. The book? Eight Million Ways to Die. I was immersed. This world of unofficial private detective Matthew Scudder was like no other. It had all the grittiness of New York, without being cliche. It moved along at a quick clip, but let you linger on page after page of exquisitely written prose. And Scudder was the first detective I ever came across who was working hard to stay sober, attending AA meetings and never saying a word for a while. Just trying to keep of the hard stuff as worlds crumbled. Lawrence Block is a hero to me, and millions of others, for getting New York City right. And now, Lawrence Block is at the helm of a new Three Rooms Press anthology: DARK CITY LIGHTS: NEW YORK STORIES. Block hand-picked 23 stories for this fascinating and thrilling book. Some crime, some humor; uptown, downtown; even a story about aliens landing in Central Park by famed sci fi master Robert Silverberg! 390 pages of glorious reading. Check out all the details here. The official NYC launch will be held at THE MYSTERIOUS BOOKSHOP in Tribeca at 6pm. More than 15 of the authors will be on hand to help celebrate this extraordinary new release with readings and signings. 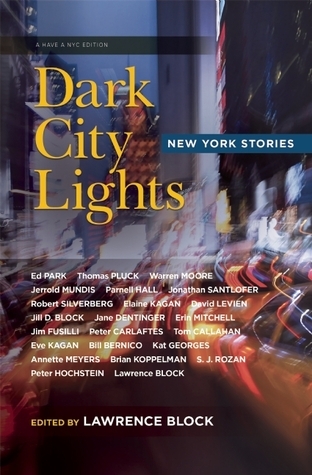 Meanwhile–You can win a chance to get a free copy of DARK CITY LIGHTS: NEW YORK STORIES–Signed by LAWRENCE BLOCK himself! We’re giving away 10 signed copies on Goodreads. Details below–Good luck! Enter to win a free copy through our Goodreads giveaway.